If you’re serious about blogging these days, you have your own webpage URL and a hosting membership. You’re also most likely using WordPress as your content management system based on its ease and ability to be customized virtually anyway you like. But are people actually reading your blogs? Are your posts SEO optimized so that search engines and other people can find them? If you’re not sure you probably need to get some type of analytics to see what kind of traffic you have. If your traffic is not ideal I suggest you read these 5 SEO Tips for WordPress, in order to gain more traffic to your pages. Tags add specificity to your blog posts that help both search engines and visitors find relevant information on your webpage. Every time you write a new blog entry, make sure to add tags in the “Post Tags” field. Each tag should be specific and targeted. It is better to have fewer tags which are keyword rich then a bunch of useless words that have little to no SEO value. To find out what keywords to use specifically, check out Google’s Adwords Keyword Tool. A permalink is a permanent URL for your blogpost. You should change the default structure so that the permalink is filled with pertinent keywords. To change the default structure you can do one of two things. Either edit the permalink to what you want, by clicking “Edit” next to the permalink, or you can set it up so that the permalink will automatically be the blog post title that’s in the title line. To do this, you simply go to “Permalinks” under “Settings” in your dashboard, and click “Custom Structure” and enter /%postname%/. WordPress also highly recommends that you add a numeric structure such as a date to go along with each post. This helps WordPress to easily distinguish between new posts and static pages. XML Sitemaps are key when it comes to SEO. An XML Sitemap is simply just a list of pages on your website. These help search engines skim through your Word Press website better and help to discover your posts. A Sitemap also alerts search engines like Google whenever you post new content on your blog. I highly recommend that you use the Google XML Sitemap plug-in to automate the sitemap for you. You can download and install this by going to the “plug-in” section of your dashboard. The Standard SEO techniques will work just fine for a WordPress site. Be sure to optimize your posts by targeting keywords in important areas of your post. The key locations are the post tilte, post heading, and anchor text of links in the post. Keywords must be relevant to the blog topic and should flow naturally and not sound too spammy. Link to other related posts, categories, and tags within each post. Make sure to use keyword rich anchor text. By linking internally, you will encourage your readers to explore other pages on your site and help search engines as well in identifying related pages and posts from your webpage. Know that you’ve read “5 SEO Tips for WordPress,” You have a much better understanding of the basic SEO functionality of Word Press. 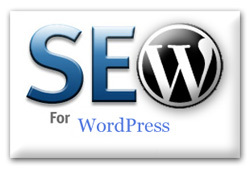 For more information on SEO for Word Press, Check out “5 Reasons Why WordPress + SEO = Awesome.” If you think you need even more help with your webpage’s SEO, Please give us a call to schedule a consultation appointment at 1-800-747-3263, or fill out the form on the right to have one of out specialist contact you Today! Excellent advice again guys! I think the one usually understated SEO advice for *any* blog is to create great content. Content makes the search engines happy and usually produces, “self-optimized” posts with great keywords, and room for a very creative and optimized title. I actually understood most of it and apply it. Nice Tips! Thanks for sharing with us. Hi I agree with you that using WordPress can help you to generate leads in the social media world. Thanks for this very important article. SEO isn’t simpel but you have to do it. Without this work, it’s very difficult to get a good rank in google. Thanks for this nice article. SEO one of the most important things you have to do, if you want that your site ranks higher in Google. Agree? Here is another article that might be helpful as well when talking about blogging and SEO combined: http://www.siteabove.com/the-blog-and-social-media-connection/. Give it a read! Hello! I think need to extend this artikle. Vielen Dank für den interessanten Artikel. Besonders im Bereich der SEO sollte man sich immer wieder weiterbilden um informiert zu bleiben. Ich danke Ihnen für den interessanten Beitrag. Auch Kundenbewertungen sind ein wichtiger Faktor im Online-Marketing. Das sollte man unbedingt beachten. Thanks for writing such a good article in the form of tips for seo of a website. It is not clear how many ways a seo can be possible to viral a Domain or URL. People always try direct method but most of time these trick don’t works for SEO. Your tips are helpful for the person to make good website optimization for me and my websites or blog. This content is so valuable and surely unique that people are happy and really helpful for them. any pressure from your side, neither in the form of request nor hint or reminder in any ways. Thanks for some very useful information! I have read your post, It’s very informative and helpful for me. I admire the valuable information you offer in your articles. Awesome information. It is helpful for beginners. Your blog has very unique information for unique topic which you have written. thanks for sharing with us good information. Great article, love to read it and got some useful information through your blog thanks for sharing it!!! All these SEO tips are handy for me. I m going to follow these strategies with my business blog. This tactics are really great for growing business. Thanks a lot for creating this kind of beneficial contents. Hier wird nochmal bestätigt wie wichtig Weiterbildung im Bereich der Suchmaschinenoptimerung ist! Vielen Dank für den interessanten Artikel. Great Tips! Thanks for sharing with us. A very comprehensive guide and i am surely gonna apply these steps on my website digitalphablet.com as well as gonna take more steps to make sure my SEO remains perfect..
Google Maps Bewertungen kaufen, schneller und toller Service. Gerne auch eine kostenlose Testbewertung möglich!